Programming note: The Universal Channel ventures into reality TV territory with the ''ready to watch'' Launch My Line. The Universal Channel (DStv 108) is venturing into reality television territory for the first time with the fashioncentric American reality show Launch My Line that will debut on the channel on Tuesday, August 10 at 22:00. In Launch My Line with hosts Dean and Dan Caten, ten contestants are paired with ten professional fashion designers competing for the chance to start their own fashion label over the course of eight hour long episodes. I've watched the first episode screener that The Universal Channel sent me and in it the wannabee designers meet up with their experts, choose their names and logos and have to design their signature pieces in their first challenge with the clock ticking away. As with these reality shows Launch My Line follows the classic lines: creating a sense of heightened drama and theatrics by enhancing trivialities, blowing up the smallest conflicts, adding pregnant pauses, placing contestants in situations and environments where they're under pressure to stir up emotions, and of course playing eccentric creative types like fashion designers off against each other who simply live for the external validation of their work from others. From the ''sweat shop'' conditions and artificial rules to build maximum tension and conflict in the alloted time, to the runway parade of their creations and the eventual judges' weighing in on the contestants' (shoddy) work, Launch My Line isn't TV coutour. However, as a ready-to-wear, ready-to-watch first reality TV addition to The Universal Channel programming slate, Launch My Line is an enjoyable (although obvious street corner knock-off) that's still a good springboard for The Universal Channel's future reality television aspirations. ''Vuzu is committed to local programming, to trying new formats and to being part of a highly creative local industry.'' So says Yolisa Phahle, M-Net's channel director for special interest who runs Vuzu (DStv 123) that just turned one. I asked Yolisa Phahle about the unbelievable success and popularity of Vampire Diaries on Vuzu (''We knew it was a great show''), why Vuzu has been so successful (''we don't talk down to our audience''), Vuzu's racier fare (''Vixens has been controversial'') and what TV shows on Vuzu are resonating with viewers. Read what Yolisa Phahle has to say about Vuzu's successful integration of social media with the TV channel ethos, what the channel is currently working on and the process of growing local TV productions for the channel's viewers. For the full interview click on READ MORE below. BREAKING. Chris Bishop working on a new doccie about oil for CNBC Africa set to debut in September. I hear through reliable sources that Chris Bishop who produced the three part Liliesleaf: The Untold Story documentary for CNBC Africa (DStv 410) (a captivating effort of almost a year that's already getting rave reviews behind the scenes from insiders within the local South African TV biz) is already working on something else. I can exclusively reveal that Chris Bishop - fresh off producing the glimpse into the Johannesburg house that was instrumental in Nelson Mandela's early political life - is already working on a new documentary concerning oil. Die new doccie on oil is set for broadcast in September on CNBC Africa. The business channel's efforts on longform programming yielded another gem this week with CNBC Africa reporter Talia Sanhewe who snagged billionaire philanthropist Bobby Seagar for a sit-down interview during his visit to Cape Town recently for a really well put together The Entrepreneurial Edge. TOLDJA! SABC2 confirms that Late Night with Kgomotso is back for a second season of her late night talk show. SABC2 just officially confirmed the news that I broke first and exclusively in June already RIGHT HERE: That Kgomotso Matsunyane will return for a second season of her late night talker to SABC2. 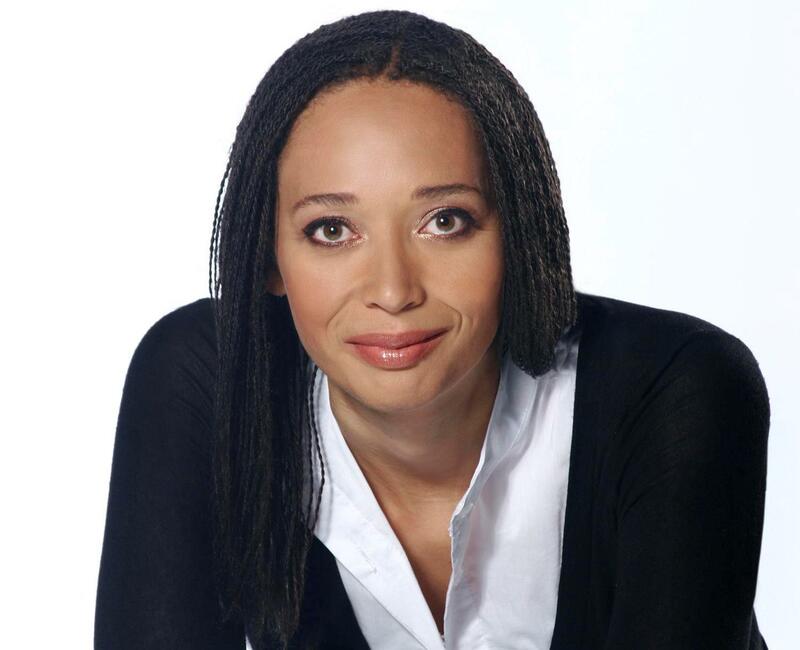 Late Night with Kgomotso Matsunyane will return to SABC2 for a second season on Saturday, August 7 at 21:35 with the host who currently has her own radio show on Kaya FM. Of course people in the local TV biz will actually know Kgomotso Matsunyane more for her stint as commissioning editor at SABC1 for local drama productions a while back as well as T.O.M. Pictures - the film and TV production company that she owns and runs. Of course she's currently a co-chairperson of the powerful industry trade body Sasfed (The South African Screen Federation). What SABC2 of course won't be shouting for the rooftops - and just to show you how schizophrenic the TV business actually really is (yes, it can make you mad) - is of course the fact that Kgomotso Matsunyane had a huge struggle to get her money for the first season of Late Night with Kgomotso which she also produced through T.O.M. Pictures from the SABC. She basically lost her house and car during the public broadcaster's financial troubles last year when local producers simply didn't get paid and are still owed millions by the SABC. 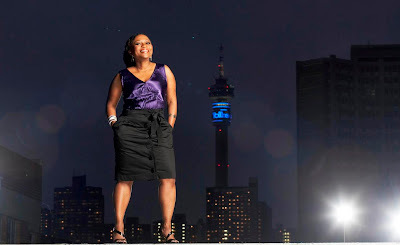 I'll connect the dots for you - and now you can see why Kgomotso Matsunyane decided to become co-chair of Sasfed earlier this year looking out for local producers' interest in this tough, tough, tough TV and film production environment. National Geographic travels to Shark Island with Nigel Marvin for a beautiful shark series in August. 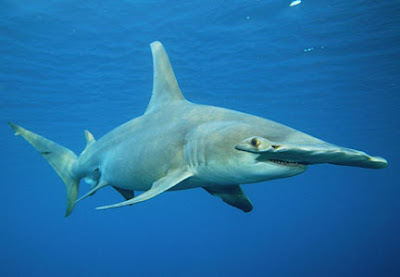 I told you RIGHT HERE earlier in the week about Shark Month returning to Animal Planet (DStv 264) in August but sharks are also popping up in August in a stunning shark series on National Geographic (DStv 260) as well. 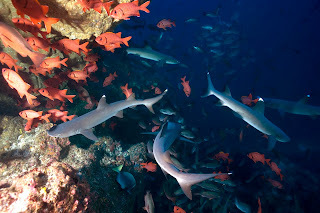 Its been on before but National Geographic has programmed Shark Island with Nigel Marvin, a simply stunning series that will debut on Monday, August 23 on the channel at 21:00 and run for that whole week in the same hour long timeslot. 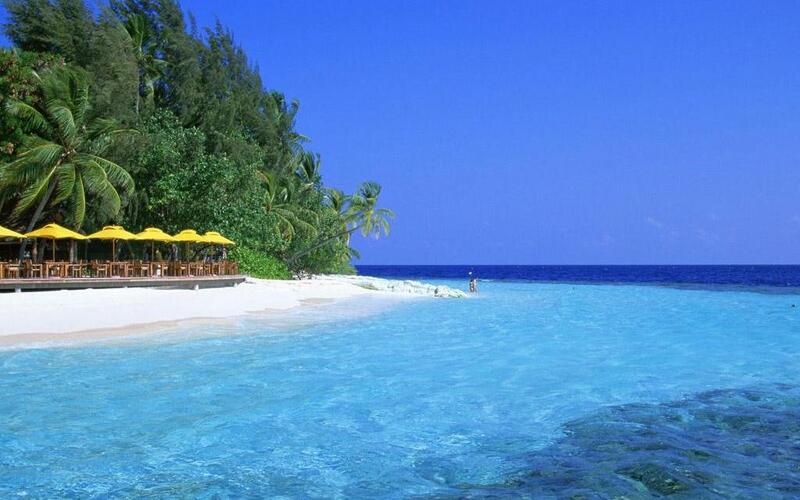 Wildlife expert Nigel Marven travels to the Pacific island of Cocos, an atoll near the coast of Costa Rica. 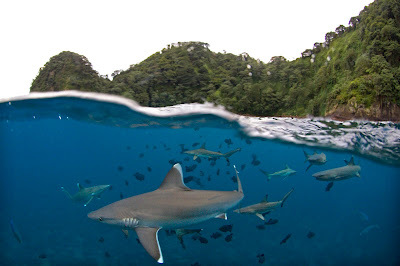 With a dive boat, a specialist crew and selection of equipment, including a state-of-the-art miniature submarine which can go 400 metres down for up to four hours, he has four weeks to discover why there is such a great concentration of sharks in the area - and the results and visual underwater footage will take your breath away. MultiChoice to make local toddler channel Koowee available to DStv Compact subscribers from Monday. DStv Compact viewers will get access to the local toddler channel Koowee (DStv 307) from this Monday, August 2, MultiChoice tells me. I was first to break the news RIGHT HERE at the beginning of June that Koowee added a Zulu simulcast sound track option, which on DStv Compact will be the default language setting. On DStv Premium the default language is Afrikaans. DStv Compact subscribers however also have the choice of changing and alternating between the two languages by using the DStv remote control. ''Adding this channel to the DStv Compact bouquet means that more subscribers will have access to children's programming in two of our indigenous languages,'' says Aletta Alberts, MultiChoice's general manager for content. BREAKING. e.tv looking for struggling small businesses who needs help in new reality show, Fix My Biz. A new reality show Fix My Biz will start on e.tv on Wednesday, September 15 at 17:30 the broadcaster told me on Friday. The broadcaster is now looking for small business owners who are struggling and want to submit their ''most significant business challenges''. Fix My Biz that will swoop in with a team of experts to help solve their problems, is looking for entrepreneurs and people running bakeries, hair salons, restaurants, manufacturing businesses, law firms or any small kind of businesses who want help. ''Local entrepreneurship is the foundation of bulding a financially prosperous South Africa,'' says Lynn Gaines, manager of local productions at e.tv. ''It's imperative that we offer support to the future business leaders of tomorrow.'' Fix My Biz will portray real South African businesses experiencing problems and work in advice and guidance with the help of business consultants on how to fix the problems. People can enter Fix My Biz by sending an SMS with the words ''Fix My Biz'' and your city to 34333 or email fixmybiz@etv.co.za with your story and problem and contact details. M-Net's Market Day adds M-Net Young Stars now looking for talented performers across South Africa. M-Net's annual Market Day which is a youth driven entrepreneurial contest is going the talent search route and is adding M-Net Young Stars that will be looking for talented performers in conjunction with this year's entrepreneurial exercise. Performers who enter M-Net Young Stars will be filmed and broadcast on KTV Power Edition as part of a special M-Net Young Stars show. In typical reality TV fashion viewers will ge to vote, contestants will be eliminated each week and on 9 October when the top two perform live on KTV Power Edition, the winner will get R20 000. TOLDJA! e.tv confirms it now has Popstars - after ''no money'' SABC1 passed on bringing the reality show back. e.tv just confirmed, late on this Friday afternoon, the news that I broke first on Wednesday already: that the broadcaster is bring back the reality show Popstars that's been dormant for most of the decade since SABC1 had it in the beginning years of the decade. On Wednesday I broke the news RIGHT HERE that e.tv secured Popstars and is planning on bringing the show back with auditions to happen in August. Then, earlier today I told you RIGHT HERE that the ''shocking'' switch of broadcasters is due to the fact that Popstars was offered to SABC1 first last year, but that the SABC had no money - hence the jump from SABC1 to e.tv who've been offered the reality show next. Now I can tell you that Popstars will kick off on e.tv on 4 September with Martin Phike as the host. 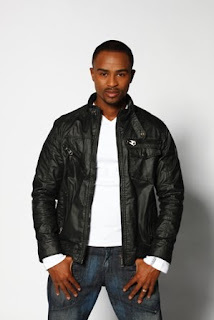 Martin Phike is a member of Ghetto Lingo that used to be one of the groups created by an earlier season of Popstars. Popstars will be produced by Mzanzi Crew in conjunction with Tartan Sound and Video and Brett Lindsay will be the director. ''Prepare yourself for more tears, more talent and more music as we follow the stories of aspiring South African hopefuls as they are transformed into Popstars,'' Brett Lindsay says. ALSO READ: e.tv ready to resurrect Popstars! ALSO READ: Popstars on e.tv would have been on SABC1 - but ''no money'' broadcaster passed. BREAKING. Popstars on e.tv would have been on SABC1 - but ''shocking'' broadcaster switch happened because of ''no money'' at SABC1. I hear that Popstars coming to e.tv soon would have remained, and would-have, could-have, should-have been on SABC1. But . . . no money. A brokeback SABC1 saw Popstars hop to rival e.tv in an unexpected broadcaster sitch where the free to air broadcaster is now super silent but plans to launch nationwide Popstars auditions in August. On Wednesday I broke the news exclusively RIGHT HERE that e.tv is planning to resurrect and broadcast Popstars soon which set of a completely flurry within the industry - the biggest question being: why the resurrection of such an ''old'' format, and why suddenly e.tv and not Popstars on SABC1? Insider sources across the SABC not attached to a particular channel has now told me that Popstars was indeed pitched to the SABC and SABC1 (the show used to be on SABC3 but then shifted for later seasons to SABC1). ''No money,'' a source tells me as to why SABC1 had to/decided to pass. ''It was during the money crunch and absolutely nothing got greenlit,'' another insider tells me. Other SABC insiders expressed great surprise at my news when I told them that Popstars will now be going to e.tv. Some already fielded calls over the past few months from producers and industry workers who thought that Popstars was returning to SABC1 - but confused SABC workers had to (honestly) say that they don't know about it and were then confused to. Now it's all starting to make sense. ''Shocking,'' said one. ''Unexpected but you can't blame them for taking the show to another broadcaster who then happened to be receptive,'' says another. In the meantime e.tv is keeping its Popstars plans tightly under wraps, hoping that it can revive the reality format looking for a group as opposed to one star, after an absence of quite a number of years from South African TV screens. BREAKING. August relaunch of 3Talk with Noeleen on SABC3 pushed to the end of August, beginning September. I can reveal that the August releaunch of SABC3's weekday local talker 3Talk with Noeleen has been pushed back to the end of August or beginning September. In May I broke the news RIGHT HERE that 3Talk with Noeleen is set to relaunch in a massive way in August right after the conclusion of the 2010 FIFA World Cup. SABC3 top brass and 3Talk with Noeleen producers decided to wait until after the soccer fever have died down, so as to not ''compete with an avalanche of things pulling viewers' attention in other directions and drowning us out completely,'' as one producer insider told me. Now I hear 3Talk with Noeleen has pushed back the relaunch of the show further and that the new look and interactive components of the talk show will only debut probably towards the end of August or the beginning of September. And get this: SABC3 has no marketing plan yet at all as to how its going to bring the planned relaunch under viewers' attention. BREAKING. MultiChoice confirms the new M-Net Movies 1 HD (MM1 HD) as a channel starting in October on DStv. MultiChoice just confirmed to me that the new high definition TV channel being added to DStv - just as I told you RIGHT HERE will indeed be M-Net Movies 1 HD (MM1 HD). ''MultiChoice would like to confirm that it plans to launch an additional HD channel, M-Net Movies 1 HD (MM1 HD) on 1 October,'' says Jackie Rakitla, MultiChoice's general manager for corporate affairs. ''Details of the channel will be communicated closer to launch. I told you in the previous story that MM1 HD will be a HD ''mirror channel'' of M-Net Movies 1 (DStv 103), in effect showing a high definition version of the exact same schedule on a new HD channel. I found other sources and verified it and can now also break the new here exclusively that M-Net Movies 1 HD (MM1 HD) will debut on channel 175 on DStv in October. BREAKING. MultiChoice, M-Net set to launch M-Net Movies 1 HD (MM1 HD) in October as a high definition mirror to M-Net Movies 1. M-Net Movies 1 HD (MM1 HD) will launch in October as the latest new TV channel to be added by MultiChoice SA and M-Net to its DStv bouquet and as an exact high definition mirror channel to M-Net Movies 1 (DStv 103). Now MultiChoice has gone and used the words ''M-Net Movies 1 HD'' (which I was told and confirmed to be the channel's name) on its own DStv website - only to then make it worse by removing it, and then still even worse by not being able to remove it fully, since the term is still searchable and pops up if you Google it, indicating that its to be found on DStv's own website. And the new FHM has a full page DStv ad touting the start of M-Net Movies 1 HD in the September issue that's suddenly on sale (and it's not even August yet). HD might stand for high drama! So, now I will tell you everything sources told me in Johannesburg and which I chose not to reveal yet until now, and didn't want to bother various publicist with and making things difficult for them by even asking. Basically M-Net Movies 1 (MM1 HD) will launch on one of the higher 170's DStv channels, probably 175 or 176 (currently SS HD2 resides at DStv 174 and will start on 13 August at 13:00). M-Net Movies 1 HD (MM1 HD) will - according to several sources working on the scheduling and back-end set-up of the new high definition channel - be an ''exact mirror channel'' of the current M-Net Movies 1 (DStv 103). From October MM1 as well as MM1 HD will focus on procuring and broadcasting movies and TV material also available in high definition, since everything on the MM1 schedule will have to run as a HD equivalent on MM1 HD. ''Obviously not everything that we want to put on MM1 and that will be on MM1 after October will be in HD,'' a source quipped to me weeks ago. ''Therefore some movies on MM1 HD will be upscaled,'' said another source. ''There's fantastic and wonderful movies MM1 wants to show and will continue to show in future that don't have a HD version, so what will be shown on MM1 HD will be upscaled versions. Viewers will however be told that they're not watching a true HD movie on MM1 HD but that it's upscaled. Of course it will be absolutely a minimum of movies since the bulk of stuff will be true HD. Upscaled movies will be indicated with a small on-screen corner logo.'' A third source confirmed the October launch date of MM1 HD. Programming note: Miss Universe pageant 2010 broadcast on Star! in August, and possibly on M-Net too. For the first time South African viewers will possibly have two choices this year to watch the Miss Universe 2010 pageant that will be broadcast on both Star! (TopTV 179) and probably also on M-Net (DStv 101) as well. Viewers will be able to stare at the beautiful young things from all over the globe with the pageant taking place this year at the Mandalay Bay Events Center in the Mandalay Bay Resort & Casino in Las Vegas on 23 August. South Africa's Nicole Flint (22) will be taking part, along with 82 contestants from all over the world. No Miss Universe 2010 host or presenters have been announced yet. Star! (TopTV 179) will broadcast Miss Universe 2010 on Tuesday, August 24 at 08:00 with a repeat later during the day at 16:00, Wednesday August 25 at 06:00, Saturday August 28 at 12:00 and Sunday August 29 at 07:00. I have asked M-Net who told me that no contract has been signed yet but that negotiations are underway to secure broadcasting rights to Miss Universe 2010. BREAKING. 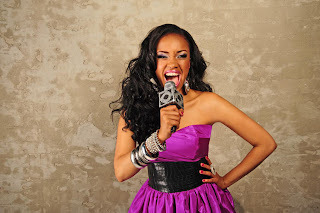 Channel O chooses Dineo Moeketsi as the new O Access presenter. I can be first to tell you that Channel O (DStv 320) has chosen Dineo Moeketsi as the new replacement for the music channel's O Access music star interview after presenter Nonhle Thema jettisoned the show after four seasons in July last year to devote more energy to the new Vuzu (DStv 123) and the daily entertainment news show V Entertainment. Dineo Moekseti who appeared in the 10th season of SABC1's Soul City was also a backup singer for Flash Republic. BREAKING. In a new deal The Learning Channel returns to Saffron TV on weekdays from August. In a new deal between Saffron TV (DStv 456) and The Learning Channel, the South African educational TV venture's rich customized tutoring material will once again be shown on weekdays on Saffron TV. Of course Saffron TV is produced for DStv by the production house Ochre Moving Pictures, and The Learning Channel (who's content is primarily seen on SABC1) has a highly synergistic working relationship with Ochre Moving Pictures already since both fall within the Avusa Media group (Avusa owns 70% of The Learning Channel). From Monday 9 August at 15:30 Saffron TV will once again be running The Learning Channel on weekdays with learning content for grade 12 that includes accounting on Mondays, English on Tuesdays, Life Sciences on Wednesdays, Maths on Thursdays and Physical Science on Fridays. ''This is a wonderful bonus the very educationally conscious Indian community that Saffron TV serves,'' says Aleeshia Naidoo, Saffron TV channel manager. BREAKING. Sony Pictures Television has ''no immediate plans'' to bring its AXN HD channel to DStv in South Africa. Exactly a week ago I wondered RIGHT HERE whether Sony Pictures Television (SPT) might be bringing its AXN HD TV channel to South Africa - but I just heard from SPT and the answer is . . . no. Last week SPT announced that the company, which is launching several HD channels across the Europe Middle East and Africa region (known as EMEA), also plans to roll out its AXN HD channel across Africa. ''The AXN HD launch that SPT referred to for Africa – planned for later this year – is the Portuguese feed of the channel which is currently enjoyed by Portuguese-speaking Angola and Mozambique,'' SPT has informed me, when I asked about the possibility of AXN HD being added to the DStv bouquet. MultiChoice's DStv is currently the only pay TV operator in South Africa with a high definition channel bouquet. ''We don't have any immediate plans for additional HD launches in South Africa at this time,'' says SPT. 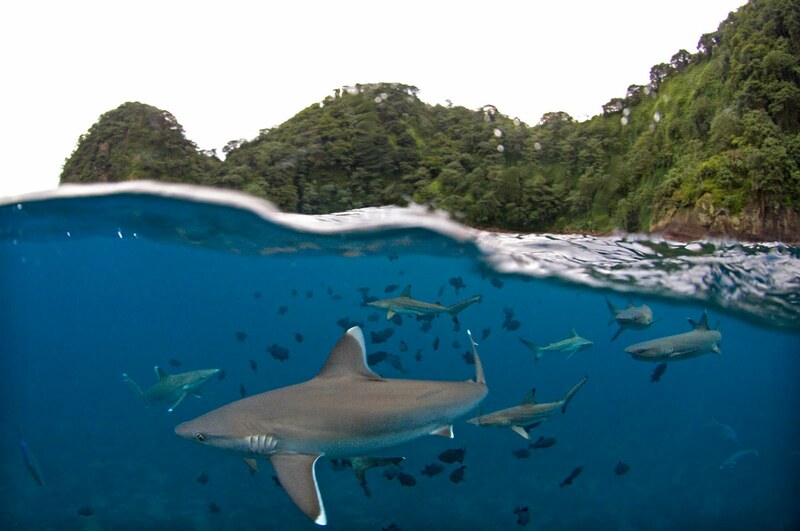 Programming note: Shark Month is back on Animal Planet with new first-run documentaries in August. August will be Shark Month on Animal Planet (DStv 264) in South Africa with several brand-new first-run shark documentaries. This year Animal Planet will premiere a new exclusive series of shark documentaries including Ultimate Air Jaws on August 4 that gives further breath-taking insight into the South African great white sharks that jump from the water to attack their seal prey. Other shows in August on Animal Planet include Great White Appetite, Deadly Waters, Shark Rampage 1916, Day of the Shark 2 and Shark Bait Beach. If you want to know more about these individual shows, click on READ MORE below for a synopsis and their specific broadcast dates. Bomb scare at e.tv's office in Cape Town has building evacuated for an hour. There was a bomb scare at e.tv's offices in Cape Town yesterday that lead to the evacuation of the building in Darters Road for about an hour. Staff I spoke to (some didn't want to) tell me they were scared, but have confindence in the security e.tv employs. What happened was that a man showed up yesterday morning at around 10:00 at the Long Kloof Studios where e.tv is based and insisted on speaking to the news editor. When he couldn't, he started screaming and threatened that he was going to blow up the place. The police were called at around 10:10 after which e.tv was evacuated and sniffer dogs sent in. The staff of 250 returned re-entered the building about an hour later at 11:00. Super 5 Media's ''complete state of collapse'', ''implosion'' could signal the end of its pay TV pipe dream. Super 5 Media, formerly Telkom Media - that received a licence but made several false promises of starting a pay TV service in South Africa - is in a ''complete state of collapse'', ''basically now just an empty shell'' and ''breaking up like an iceberg over the past few months before our eyes''. So says disillusioned former, and disillusioned current (and sad!) employees of the Centurion based company that had dreams of becoming one of the new pay TV operators in the country. Meanwhile Super 5 Media refuse to respond – if it is that there's even still anybody left to pick up a phone. Super 5 Media as I've told you RIGHT HERE exactly a month ago, is simply not responding in any way to media enquiries and is on the verge of losing its licence that was granted to it by the Independent Communications Authority of South Africa (Icasa) way back in 2007. Super 5 Media which is 75% owned by Shenzhen Media must start a viable pay TV service by the end of September 2010 or lose its licence permanently – which as things stands now, will most likely happen. Millions of rands has been sunk into this once optimistic venture over the past four years with Super 5 Media now having virtually nothing to show for it. Telkom Media was once primed by industry experts as the frontrunner to be the first rival of those granted Icasa licences to start a viable pay TV business as competition for the then-incumbent MultiChoice. Not only did On Digital Media (ODM) start its TopTV service in May to claim this honour, but Super 5 Media is languishing in a debilitating and self-destructive void of inoperability while it has been sucking up countless millions over the past few years without discernably moving any closer to providing any tangible pay TV product launch(es) - despite hollow promises. ALSO READ: With retrenchments happening at Super 5 Media, is this the end of its wannabe pay TV operator dream? ALSO READ: Failure . . . again! Super 5 Media misses its promised June starting date. ALSO READ: Yawn. Super 5 Media misses its May launch date. Now promises to start in June. BREAKING. e.tv resurrects Popstars! The broadcaster's ready to join the reality TV talent search madness with national auditions in August. I can exclusively break the news that e.tv is bringing back the reality TV show Popstars that will look for a new pop group ensemble act. There's not as much as a peep yet from e.tv that's decided to take over Popstars that used to run on SABC3 before it got shifted to SABC1 in 2003 and gave South Africa names like the shortlived Adilah, Afro-Z, 101, Ghetto Lingo and Jamali. Now the broadcaster is getting into the overheated South African reality TV season where Popstars will have to battle it out and compete for some attention and viewers with Idols VI (M-Net), Big Brother All Stars (M-Net), SA's Got Talent II (SABC2), So You Think You Can Dance? II (SABC1), Survivor SA Maldives (M-Net) and now even ONE Gospel looking for a reality star who can sing in that channel's new reality show called Shine. Of course e.tv is going to have a bit of an uphill climb trying to not only explain why its bringing back an old international reality show concept that was on the SABC, but will also have to get viewers to realize that Popstars has now actually moved to e.tv and will no longer be broadcast on the SABC. I can tell you that e.tv's Popstars plan to kick off national auditions in August and that people between 18 and 28 will be able to audition on an individual basis after which the producers will - as Popstars progress - start to group contestants together. Entry forms can be filled in on the day and contestants only need to take an ID book along. After the countrywide auditions it will be time for a national workshop with the Popstars contestants who will allo converge and have to live together in a secret house while they start practicing, rehearsing and living together as a group. In the house - with cameras filming everything, they will have to come up with a name, an act and songs. As I've said, not as much as a word from e.tv on any of this yet. O HALLELU! Gospel singers get the chance to Shine in ONE Gospel's new reality talent show. 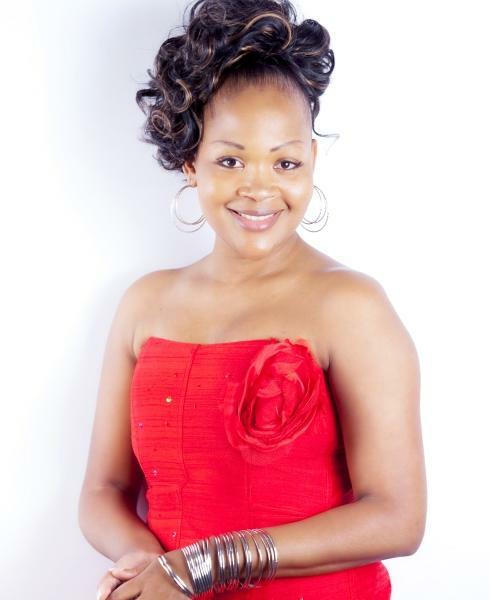 ONE Gospel (DStv 331) is getting into the reality talent seach craze with the channel's own reality show called Shine. Shine will be hosted by TV presenter Zanele Mbokazi and gospel musician Lionel Petersen and will be looking for South Africa's next great gospel music act. According to ONE Gospel, ''performers who have dreamt of sharing the stage with phenomenal and successful musicians like Rebecca Malope and Joyous Celebration, now have the opportunity to showcase their talent. Soloists, bands, choirs or instrumentals all qualify to enter the competition.'' The auditions will start in Mamelodi, Pretoria on August 5, then move to Soweto, Polokwane, Durban, Nelspruit and end in Cape Town in September. The judges will choose two finalists from each region (12 in total) who will travel to the ONE Gospel studios in Johannesburg to compete further. Every Sunday, performers will need to impress the judges and three finalists will be eliminated at the end of each episode. In the final episode the judges and the studio audience will vote for the overall winner. Besides a recording contract from SouthStone Records the Shine winner will also sing at ONE Gospel's first concert in December. The first episode of Shine will go out on Sunday August 8 at 17:00 on ONE Gospel. Here's the specific audition dates and cities: 5 & 6 Aug: Mamelodi, Pretoria; 12 & 13 Aug: Soweto, Johannesburg; 19 & 20 Aug: Lakazi, Nelspruit; 26 & 27 Aug: Seshego, Polokwane; 2 & 3 Sep: Khayelitsha, Cape Town and 9 & 10 Sep: Umlazi, Durban. For the audition you need to take your ID book along and prepare a gospel sing. MultiChoice's new 3G video on cellphone service, DStv MOBILE launching in August but still with a limited usage warning. MultiChoice will be replacing its Vodafone live! mobile TV service with a new - yet still severly, restrictive and greatly hampered mobile TV service - in August that will only be available to 3G cellphone users. It will be called DStv MOBILE and encompass 11 different video channels. With DStv MOBILE, 3G cellphone users will get access to video on their cellphones for R59 per month or R19 a week, although MultiChoice reserves the right to terminate a service as soon as a subscriber has esceeded 45 minutes for a weekly, and 180 minutes for a monthly subscription. MultiChoice refers to this only by saying, ''the service is subject to a fair usage policy''. That's not very good for potential subscribers who would want to follow the drawn-out and reality-soap narrative of shows such as Big Brother All Stars and the content from the Idols Extra channels that can severly eat up streaming minutes and will be available on DStv MOBILE come August. MultiChoice would ideally like to offer this video on cellphone service using the DVB-H (digital video broadcasting - handheld) standard but the incompetent Independent Broadcasting Authority of South Africa (Icasa) that regulates the TV industry in South Africa has been dragging its feet for years and has up to now not been able to get its act together to issue mobile TV operator licences. ''The cellphone is fast becoming a central platform for media consumption and the new DStv MOBILE service gives Vodacom customers the freedom to access their favourite DStv content,'' says Mark Rayner, general manager of DStv MOBILE. Other channels on DStv MOBILE will include SuperSport Live Events (once again: how much sport can you watch before you breach your monthly limit and get cut off? With DStv MOBILE you'll be able to watch hardly two soccer matches of 90 minutes each with no extra time before you're cut off.). DStv MOBILE will also carry SuperSport Blitz, Channel O, Trace TV, Cartoon Network, Boomerang, Africa Magic, CNN's CNNi, SawSee (a movie trailer channel), E! Entertainment and Weather24. Limited videos from M-Net, kykNET and Vuzu will also be available. Programming note: Zone Reality explores the unbridled pursuit of beauty at any cost in Vanity Insanity. Perfect scheduling is Vanity Insanity on Zone Reality (DStv 125) weeknights at 21:00 where you can just relax, sit back, and shake your head at the simply unbelievable length some people will go to to enhance their appearance. Every weeknight until Monday, August 9 you can catch Vanity Insanity and stare at vanity-obsessed people taking surgery, tanning and exercise regimes way too far all in pursuit of building a better body. The half hour documentary series examines what it is that drives people to the ultimate pursuit of beauty at any cost. BREAKING. Survivor SA Maldives on M-Net: All the details on how to enter in the upcoming nationwide open audition process! M-Net just announced in a promo on the pay broadcaster that the entry process for the upcoming fourth season of Survivor SA that will be filmed in the Maldives will be taking the form of a nationwide city by city open audition process. As I was first to tell you RIGHT HERE the nationwide Survivor Maldives entry process will indeed be held in several cities. M-Net has now confirmed that people will be able to cue in Cape Town (21 August), Durban (28 August) and Johannesburg (4 September) to appear before the strict selection panel for their turn to dazzle. A shortlist of 60 people will be chosen by the panel out of which they will make their final choice. *You do not need to fill in any entry form before the time, you can just show up in Cape Town (21 Aug, The Riverside Golf Club, Observatory), Durban (28 Aug, Sahara cricket stadium, Kingsmead) and Johannesburg (4 Sep, Bidvest Wanderers cricket stadion, Sandton). *You need to be older than 21, be able to swim, be physically and mentally healthy, have a valid passport and be a South African citizen. *Open auditions (which means anyone can just show up and register) will start at 09:00 on each of these open audition days. Gates already open at 08:00. Registration will close at 15:00, which means you have to get there before that time on these days. Only one audition day will be happening per city. *The validity of your passport needs to be checked, so take your passport along. *Clothing: ABSOLUTELY ANYTHING but be creative and dazzle! Make a lasting impression with your personality and choice of wardrobe on the selection panel. BREAKING. Survivor SA Maldives entry process to take the form of a massive, nationwide open audition process. I can be first to reveal that tonight - anytime from 17:30 on M-Net, the pay broadcaster will make the big announcement that the entry process for the new Survivor SA season set to be filmed in the Maldives that M-Net announced earlier in the week will be taking the form of a massive nationwide open audition process in which contestants will have to show up in the flesh to try and impress the selection panel in cities around South Africa. M-Net will make the announcement this evening anytime from 17:30 and will run a promo telling viewers exactly how to enter for Survivor SA Maldives. I can tell you that nationwide auditions by Endemol SA will be taking place soon in three cities, most probably Cape Town, Johannesburg and Durban. Contestants will have to show up in Idols style before the strict selection panel in the flesh and try to win them over with their personality and unique combination of looks, skills and maybe a rare talent. I can tell you that Survivor SA Maldives, the fourth season in the Survivor SA franchise will be filmed between the end of September and the end of December by Endemol SA somewhere in the Maldives, about 700 km south west of Sri Lanka. Contestants will have to be able to ''disappear'' for about a month. I've reliably learned that M-Net - due to great viewer feedback - already decided during the broadcast of Survivor SA Santa Carolina to do a fourth season, although the final decision has only been taken very recently. Several island destinations were considered, but the pay broadcaster looked at islands like the Maldives with enough infrastructure to enable filming of the reality show, but that's still isolated enough to give that Survivor feeling. M-Net is once again filming Survivor SA Maldives on its own just like the previous season without the co-operation of international broadcasters or logistical or gaming support services. Lani Lombard told me that contestants will ''have to prove that they can make good TV and why you think you can win. It always helps if you know what the show is about that you're entering for. 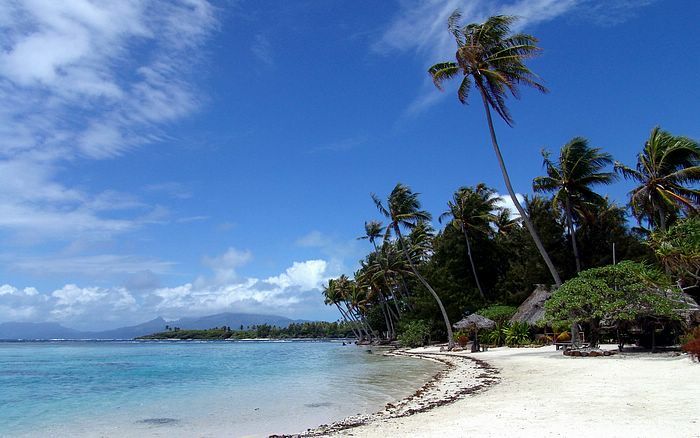 Survivor SA is not about living in the lap of luxury on a deserted island. You have to survive and its a very strategic game.'' Tune in to M-Net from 17:30 to catch the promo and all the entry details. 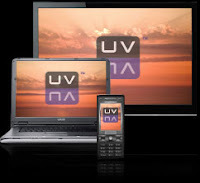 UltraViolet ready to become the new omni-platform format for all devices to watch digital video. In the works since 2008, Hollywood unveiled a name and logo this past Monday for what the entertainment industry hopes will become the new omni-platform, all-playing format to watch your video on almost any device – from TV's to cellphones and game consoles to Blu-ray, DVD players and computers. Its called UltraViolet. UltraViolet – a collaborative industry effort to create an omni-platform digital video format debuted its new logo, UV, on Monday and it's website you can find RIGHT HERE. It plans to start beta testing UltraViolet in September as a standardized new system for downloaded video content and applications like buying movies and downloading them for instance. The consortium developing UltraViolet was basically inspired by the automated teller machine (ATM) as a way of how different businesses (banks) can interoperate by allowing people to use different devices but be able to get access to the same things irrespective of which one they use. Technology companies like Microsoft (not Apple yet! ), Hollywood's biggest studios like Sony Pictures, Warner Bros., NBC Universal, Fox Entertainment, Paramount Pictures, (not Disney yet!) and electronic consumer product manufacturers like LG Electronics and Samsung (58 companies in total) are all working together to create UltraViolet, a new common file format that enables fire sharing and universal video playback for any bought (whether on physical DVD on through the internet as a digital file) and downloaded content on basically any device you have, named after the part of the light spectrum that's invisible – yet everywhere. How UltraViolet will hopefully work in the future is that whether you buy a physical DVD or buy and download a movie it will come with a token key that indicated its yours. The UV logo will identify to consumers that things work together seamlessly and that digital content can be transfered and will play. ''Our goal is to firmly establish UltraViolet as the symbol for digital entertainment – one that gives consumers the freedom of access wherever they are, the confidence of knowing how it will work and the broadest choice of content, stores and devices,'' says Mitch Singer, president of the DECE consortium that's developing UltraViolet, in a press release. 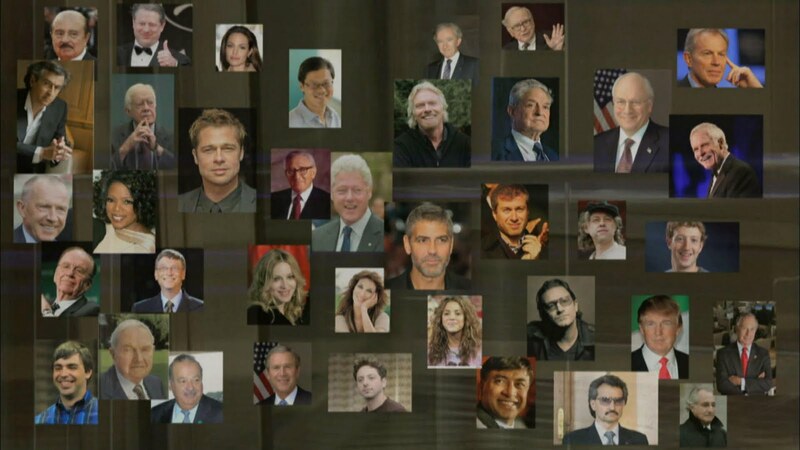 Programming note: An insightful look at the world's new powerful global elite in Al Jazeera's regular Empire documentary slot. What I think is going to be a simply brilliant documentary will be broadcast in the week ahead on Al Jazeera (DStv 406 / TopTV 401), so make a note to watch. Al Jazeera's regular end of the month Empire documentary starts on Wednesday, July 28 at 21:00 with this month's edition entitled ''Superclass''. ''They fly on private Gulfstreams, set the global agenda and manage the credit crunch in their spare time,'' Al Jazeera tells me about the doccie looking at the world's new elite: our modern-day global aristocracy and the unelected, superclass people who wield tremendous influence and power in today's world. ''They're the self-made super rich who are using their money to lay down a new set of global rules. 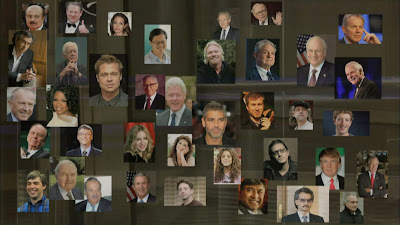 They have more in common with each other than with their countrymen - an elite group who have money, power and influence and are shaping the future of the world''. This promising-to-be-brilliant episode of Empire will debut on Al Jazeera this Wednesday, and then repeat daily until Sunday. SPACE OUT! Syfy would LOVE to return to South Africa. Will DStv or TopTV be first in the new space race to show Syfy some love? Well Ripley, believe it or not: I can reveal that the Syfy channel would love - let me emphasise that - simply love to be (back) in South Africa. The only question is: will it be MultiChoice's DStv or On Digital Media (ODM)'s TopTV who will be first in the space race to show Syfy some love and snap up this niche, yet neutron star? DStv unceremoniously jettisoned the Sci Fi Channel in 2004 out the airlock just like Hal tried to do to Bowman in that other odyssey. Then, like a malfunctioning R2 unit, DStv cited low viewership for the Sci Fi Channel's untimely demise, saying that the Sci Fi Channel was just not popular enough, that science fiction as a genre wasn't watched enough in South Africa and that the channel was just too niche. Well. Sadly that Jedi mind trick worked but the last time I checked that movie with flying dragons and blue people (and I'm not talking the new Smurfs) is very popular. Perhaps its high time that DStv or TopTV reopen 'em pod bay doors, Hal! I asked Universal Networks International that operates several channels - also Syfy (the Sci Fi Channel has since been renamed) - about their expansion plans in South Africa. The answer was quite revealing and interesting - indicating that Universal Networks International would love to bring Syfy back. For added perspective on this, keep in mind that MultiChoice also carried out a little known survey earlier the year to test how viewers would feel about a possible science fiction channel. With MultiChoice's new viewership measuring tool DStv-i even a channel such as Syfy with a small but dedicated and devoted audience and following would now be able to be measured and quantified for advertisers - something that wasn't possible even a year ago. Should Syfy make a return back to the future in South Africa, the channel - fondly remembered by viewers - will also garner new fans who would be, well, just over the moon.